Allen Mayes said “I am delighted that we have secured the funding for the independent dust test due to a generous full cost donation from Apex Platinum Investment ltd. This now means that we can get answers on what is in the dust itself so we can go back to the relevant authorities and demand action is taken immediately. The tests will be carried out by the MLM Group over the months of June/July as to catch the issues at its worst with the warm, dry weather. This issue has been going on for too long and the current elected representatives of the area have contributed very little to the cause. This has been a long process with lots of people previously involved, however since November last year this issue has been pushed and pushed by residents and myself. We have successfully made the council listen and take this seriously, along with the Environmental Agency. I would like to thank all the residents that have been involved in fighting for this, signing the petition and asking questions at the council meeting. I have spoken to many residents about this issue and I have fought hard to get to this position, however there is still a long way to go and the fight is not over yet. I truly hope I can represent this wonderful area as their councillor after May 2nd and carry on fighting for what people need. This is just one of a number of issues that the incumbent councillors have failed to address and this is simply unfair on the residents of Tilbury Riverside and Thurrock Park. 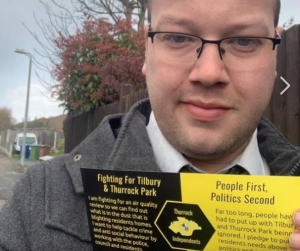 YT will be speaking to the other Tilbury St Chads candidates in due course. A list of candidates can be found on our politics channel.